Presentation summary: Social media platforms (like Facebook, LinkedIn and Twitter) represent incredible potential for researchers to conduct research and recruit survey participants. However the old rules still apply, along with some new rules too. This presentation looks at current and emerging issues in conducting research on social media and recruiting participants using social media channels. It also covers guidelines that apply to your activities, examples and some best practices. I was quite busy in 2013, I co-presented at 4 different, research and researcher focused events plus delivered a solo presentation at a Customer Service forum held by the Local Government Manager’s Australia Western Australia (LGMAWA) and Customer Service Benchmarking Australia (CBSA) and a solo presentation to the Human Research Ethics Committee (HREC) of the university I work at. While I can’t share all my presentations, there are some that are available for download online. These ones I have been able to get permission to upload to my personal slideshare, and can therefore share with you! 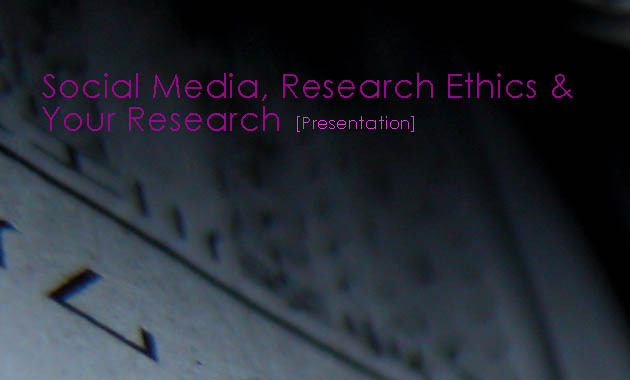 This is a co-presentation I delivered with ECU’s Research Ethics Officer during ECU’s Research Week 2013, looking at some of the challenges and opportunities social media presents researchers in terms of conducting research on social media and recruiting participants in research studies via social media as well as the codes that govern ethics decisions. The aim is to educate researchers who want to research or recruit using social media and also prepare them for what they need to document within their research ethics applications.